This one is for the ladies – especially those who have plenty of social functions to attend to all year round. After all, even if you’re dressed to the nine with baubles hanging around your neck that will put even the Queen of England to shame, all those will amount to nought if you happen to have some facial hair hanging around in an unwanted manner. Here’s where the Fine Facial Hair Remover is able to help, and as its name suggests, this device will go all out in removing those fine, hard-to-reach facial hairs which are survivors of traditional waxing or tweezing methods. The unit comes with a rotating coil that will zap away short, fine hair at the root, preventing ingrown hairs and leaving skin smooth for up to six weeks. This is a hypoallergenic coil, so no worries about breaking out in a bad case of pimples after that. 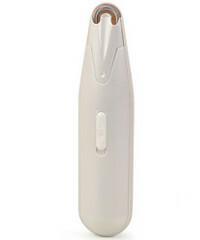 Powered by a couple of AAA batteries, the Fine Facial Hair Remover can be yours for $39.95. A lot cheaper than the no-no device that’s being plastered in infomercials! Can the fine facial hair remover be used on the ears and if not why. Thanks.